This evening, we stand in support of ADM and its struggle, with the screening of An Autonomous Life, a documentary directed by Nick Polson & Max Somojino, which captures ADM visually. Along with the documentary there will be extra (archival) footage and time for Q&A afterwards. In 1997, ADM – the largest and oldest cultural free-haven in the Netherlands – was created. Situated on a harbor terrain, it has been the home of more than hundred kinds of creative people that share a mindset of experimenting and creating an alternative to the dominant values of modern life. In recent years, ADM has been under threat of eviction. Currently the government has ordered it to leave its space before the start of 2019. This has started a fierce debate on space and ownership, which has come to represent larger processes happening in Amsterdam in which public property is sold to private investors and cultural free spaces are being closed down. In Dutch & English w/ English subtitles. 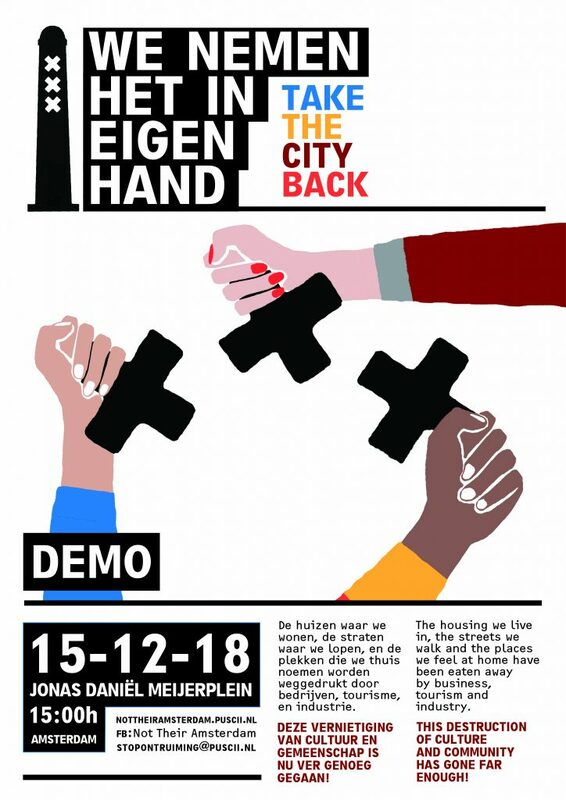 Demonstratie: Pak de stad terug!